… or how can one plan to see two movies in one evening and actually see a completely different one. Yes, it is possible and it is not actually our fault. As I have written in a previous post, TIFF has started and is ongoing for the entire week. 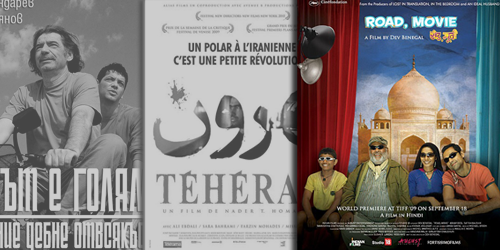 We have planned to see two movies: The World Is Big and Salvation Lurks around the Corner, a Bulgarian film and after that, Tehroun an Iranian/French movie. According to the plan, we could finish just in time with the first movie to get to the other. So let’s start with the cinema of the first movie: Cinema Echinox, an open air cinema, inside the walls of the Babes-Bolyai University. As a second very important information I have to mention, that the rain was pouring as if the whole city were under a great shower. The result: the movie was canceled… no matter, we were told, that we can get voucher’s for the ticket which we could use to watch another movie during the festival. So far so good… we went to Cinema Republica, a full-size cinema, protected from the rain. The second information that needs to be told here, is that Cinema Republica was the refugee cinema for another open air cinema of the festival, meaning that in case of rain, the movie from the main square was moved to this cinema. As I wrote before, it was raining. Movie no.2: canceled. So now, we had the option of watching the movie which was moved in from the main square: Road Movie, an Indian movie, or be satisfied with a nice stroll in the city center in a rainy evening… we chose option one, and exchanged our voucher’s to enter the Indian movie. 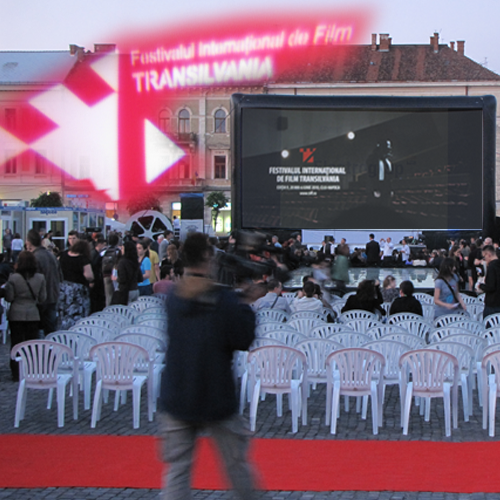 TIFF (Transylvania International Film Festival) has reached it’s 9th edition, and the opening ceremony was planned to be held in the city’s main square in an open-air cinema. The few clouds which were responsible for the afternoon rain have been swept away, so everything was set for the grand opening of the festival. I have to admit, that although I am a movie-fan, this was my first year when I actually went to see any of the movies of the festival (yes, shame on me…). There is however a beginning for everything and it’s better late than never. I payed the entry ticket of 15 RON’s for the ticket. At first I did not understand why pay, if it’s an open-air cinema in the city center, but now I do: no film is good enough to watch on foot, especially in a rather chilly evening. For this money there have been some chairs set up and blankets have been provided by one of the sponsors (HBO). The opening ceremony started with a general presentation of the festival, some “trailers”, presenting the jury and some of the events that would take place in this period. A lot of hard work, a lot of commitment: THANK YOU!. After the opening ceremony the film was presented: Soul Kitchen. I have to say it was a quite good movie for a comedy. It was an “easy movie” but by far not like some of the Hollywood trash that is starting to appear lately. The public liked it very much, too. I can only recommend it to anyone 😉 . Last weekend we went to see another movie. Again we went to the same multiplex as last time: Odeon. This time we did not go for a 3D movie, instead we decided to watch a standard movie, having the usual surround-sound the only extra. Sherlock Holmes seemed to be the movie with the most interesting title. With a ticket price of 15 RON (€3.5) it seemed like a pretty reasonable deal. We bought the ticket and went to buy some refreshments. From my side, this meant to buy a large popcorn for 8 RON (a little less than €2) and went to the entrance. Although I’ve been to Odeon a few times already, this is the first time I noticed, that there is actually another level above the one I have already been to… Well, I guess people can learn something new every day 😛 . Also this was the first time, that I noticed that the color of the walls is quite stylish, with a happy mix of bold colors which I really like. OK, so on to the movie: it was… ok. With a modest number of twists and a lot of funny scenarios. The British detective is presented in an entirely new light. Mr. Holmes (Robert Downey Jr.) is, in this movie, a real fighting machine with a complex, but always calculated way of thinking. His companion, Dr. Watson (Jude Law) has in my opinion a simple role, with a “common” way of thinking, no tweaks, no evolution of the spirit during the movie (Good old Watson). As people might expect, both actors give a good performance, I really did not see any problem with that.